Warsaw Board of Works met for its bi-monthly meeting Thursday. From left are Lynne Christiansen, city clerk-treasurer; Mike Valentine, city attorney; Mayor Joe Thallemer and Jeff Grose, board members. During the brief discussion it was noted the U.S. Fish and Wildlife Service and the Indiana Department of Natural Resources were requiring the low head dam to be removed to open up the Tippecanoe River for fish travel. There were also safety concerns. Brian Davison, utility superintendent, noted there should be no cost to the city. The grant is reported to be $80,000. Davison explained the dam was installed in the early 1960s to divert the Tippecanoe River into Center Lake should a drought ever lower lake levels. At that time, the lake was used to provide city water. “It serves no purpose anymore,” said Davison. He added the dam’s removal will have no impact on water levels at Center Lake. The bi-monthly meeting also included the opening of bids for the Osborn Stormwater Pump Station improvements. Bids from three companies were taken under advisement for review and will be awarded at the next meeting, Dec. 2. 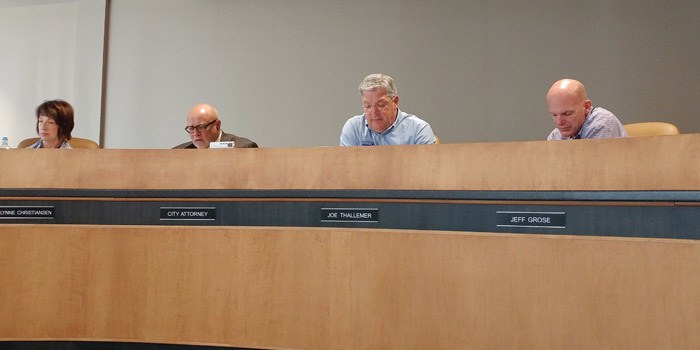 Bids were opened from Crosby Construction, Fort Wayne, with a base bid of $293,110; Ottenweller Contracting, Fort Wayne, with a base bid of $201,000 and Selge Construction Co., Niles, Mich., in the amount of $197,240. A $7,000 grant from the DUI Taskforce for Warsaw Police. An agreement with North Central Co-Op for diesel and gasoline for the public works department Dec. 1, 2016, through Nov. 30, 2017. A memorandum of understanding for ice melting materials with Warsaw Community Schools. The purchase of a 2000 International Tandem Dump truck from Stoops Freightliner for $11,250. Three vehicles: a 199 GMC dump truck, 2001 Ford S24 Van and 1999 Ford 1 Ton will be traded in. A new truck, according to Jeff Beeler, costs $250,000 and will haul what two trucks do currently. An amendment, not to exceed $27,000, with Christopher Burke Engineering, South Bend, on the Eisenhower Basin Design for further engineering. Preventive maintenance agreement and warranty renewal program with Gardner Denver Nash for the wastewater treatment plant. An agreement with Umbaugh and Associates for the purposed financial advisory and accounting services cost of service study and system development fee for the wastewater department. A cost of $35,500. Amendments to the Buffalo Street engineering contract and CR 300N engineering contract along with the final change order for the East Market Street project and final pay application for the East Market Street project. The Buffalo Street amendment is an additional $39,300 for preliminary plaza design and environmental permitting; the CR 300N amendment is for $43,329 in engineering fees to include curbing, lighting and storm water system; and the change order for the East Market Street project is a reduction of $88,041,96. The final pay application on the East Market Street project was approved at $115,102.96. An agreement with Larry Clifford, for hearing officer services at $900 per meeting with a minimum of nine meetings per year. The next meeting of the board will be at 10:30 a.m. Friday, Dec. 2.